1 - In response to a question about his team's execution - "I'm all in favour of it." 2 - On an interception thrown by Steve DeBerg in 1984 that cost the Bucs a game against the Giants - "It was thrown to nobody. Well, it was thrown to somebody, Harry Carson. But he happened to be playing for the New York Giants at the time. It would have been a good pass if Harry had been playing for us." 3 - After a particularly heavy loss - "The bus leaves in an hour - anyone who needs a shower, take one." 4 - On losing a key game - "I told our players that there were 700 million Chinese people in the world who didn't even know the game was played. The next week, I got five letters from China asking "What happened?" 5 - After the Bucs broke their 26-game losing streak - "Three or four plane crashes and we're in the playoffs." 6 - On recruiting his son John to play for USC and then the Bucs - "I had an advantage - I slept with his mother." 7 - On the prospect of a late-season trip to Green Bay - "Going there is like winning the 98th prize in a beauty contest with only 97 prizes." 8 - On hearing how Buc kicker Pete Rajecki was nervous about McKay watching him in the 1976 pre-season - "That's unfortuntate as I plan on attending all the games." 9 - At a post-game press conference in 1976 "You guys don't know the difference between a football and a bunch of bananas." 10 - The following week after a media member has dropped off a case of bananas at his door - "You guys don't know the difference between a football and a Mercedez-Benz." 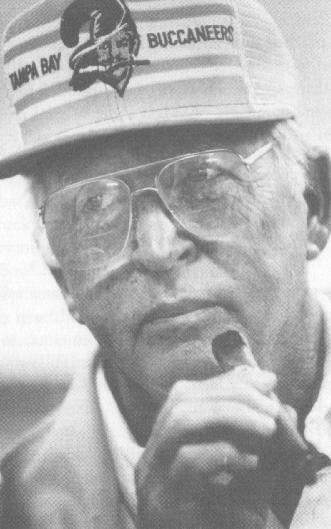 John McKay was the first head coach of the Buccaneers, holding the reins for nine seasons. He had previously won four national championships with the University of Southern California but was hand-picked by Hugh Culverhouse to take over the expansion franchise Bucs in 1976. "I had a five-year plan" he said about his work in building the Buccaneers and taking them to the NFC Championship Game in just their fourth season. "But that was because I had a five-year contract. If I had had a three-year contract, I would have had a three year plan." McKay was never short of a quote and his perseverance through the midst of the 26-game losing streak was in no short part to his humour and quick ability for a quote. His determination to install a power I-formation running game and 3-4 defense gave the Bucs the basis for their incredibly quick rise to ascendancy in the NFL, the fastest any team had reached the championship game in any US pro sport at the time. Always outspoken, even his final game was extraordinary as he even told his defense to allow the Jets to score to give James Wilder a chance to break the NFL's combined rushing and receiving record. John McKay died in 2001 but his legacy with the Bucs remained through his son, Rich, who was the General Manager of the franchise from 1995 to 2003 before moving on to the Atlanta Falcons in the same role. Another son, also named John, played wide receiver for the Buccaneers in their first three seasons and was GM of the Los Angeles franchise in the XFL.